Post by Pole Harmony, LLC. It's official! 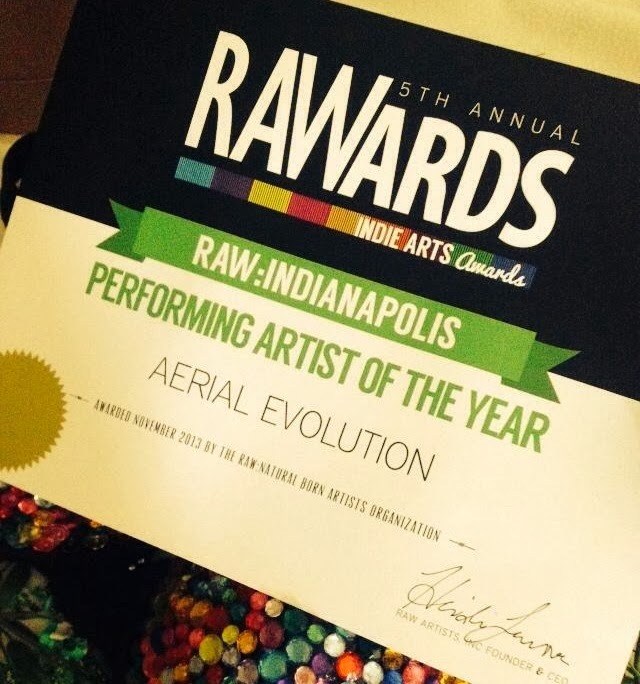 We are proud to announce we won the title of Indianapolis RAW Performer of the Year 2013! What is RAW? RAW is an international community of artists ranging in a multitude of genres including fashion, independent film, music, visual art, performing art, hairstylists, makeup artists, and more. Local artistic talent is chosen by a local RAW Director and showcased in one of the many once a month circus like events that run every year from February through October all across the nation and globally. The season ends with a large RAWards (RAW Awards) show in Hollywood featuring the top artists from the global community. This past summer, I had the honor of performing with my friend Patricia Boylan-Riggs, owner of Pulse Fitness and Dance in Fort Wayne, Indiana, in her professional pole dancing performance group, Aerial Evolution. Little did I know, that performance would set the stage towards a powerful duo in the pole dancing community that would capture the essence and powerful meaning of pole dancing as an artistic form of expression. Coming into this experience, we had no expectations of where this opportunity would lead us. We both danced as though we always do and at the end of the night, we were happy to have been a part of such a unique show. 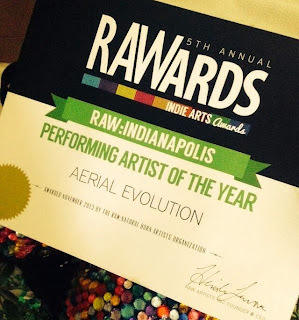 In October 2013, we were informed we'd been selected as semi-finalists to attend the season finale RAWards local Indianapolis event. Again, with little expectations of what the night would truely mean for us, we went and showcased our interpretive routines and called it a night. Neither of us believed we'd be waking up the next morning with a new title of recognition next to our names. At the moment of reveal for the winners, neither of use were around when we were officially recognized. I, who also works full time as a Registered Nurse in a public health and community management role as well as being a small business owner and solo operator of Pole Harmony part time teaching 7 classes a week, left the event around 9 o'clock because I had to report to early riser duty the following morning. Patricia broke down the portable stage and went to replenish her energy by having a delicious meal with her husband. The thing about pole dancing is, it strips you of all your energy and reserves and if you don't eat shortly thereafter, things could get unpleasant fairly quickly. For the dancer and everyone around them. (Ha-ha). Our sincere apologies for being absent during the big reveal. I can honestly vouch sleep and hunger won the debate with these two performers.